At the time of writing Tottenham have already spent £50m on Paulinho, Chadli and Soldado with 19 days still remaining in the summer transfer window; and, despite the continuing rumors over one Gareth Bale’s future in the side, it is undoubtedly an exciting time to be a Spurs fan. But what exactly will these three new players bring to the club? Voted third best player at the Confederations Cup this year, Paulinho is a classic box-to-box midfielder with a knack for finding the net. His ability to defend well and then rush into the box past the strikers caught the eye of many in the World Cup’s dress rehearsal, where he scored 2 goals in 4 appearances. Likened to Frank Lampard; the Brazilian will look to bolster the goal threat from midfield of a Spurs side who were heavily reliant on the goals of Gareth Bale last season. During his 4 appearances for Brazil in the Confederations Cup; he won an impressive 12 tackles and made 5 interceptions, his 87.1% pass success is also notable. It is likely that AVB will deploy the Brazilian in a midfield 3 alongside Dembele and Sandro, to form a formidable trio by anyone’s standards; with Paulinho playing in his preferred box-to-box role further forward. The arrival of Belgium international Nacer Chadli could see the end to Aaron Lennon’s right wing dominance at White Hart Lane. Becoming the third Belgium at Spurs, Chadli is a versatile wide man with a wealth of experience, but it is his goal scoring ability that is likely to see him take the place of Lennon, who has scored just 25 goals in 191 appearances for Spurs, whereas Chadli notched up the same total in just 84 appearances for FC Twente. His form last season was particularly impressive scoring ten and setting up five in 22 appearances in the Eredivisie. If Bale stays, Chadli will allow the Welshman to further express his free flowing game with the 2 being able to continually switch position in forward three of a likely 4-3-3, alongside Soldado. The Spaniard signed from Valencia for a club record fee of £26m, at 28 years old it looks to be a very un-Levy like signing, with the player’s value likely to have peaked. 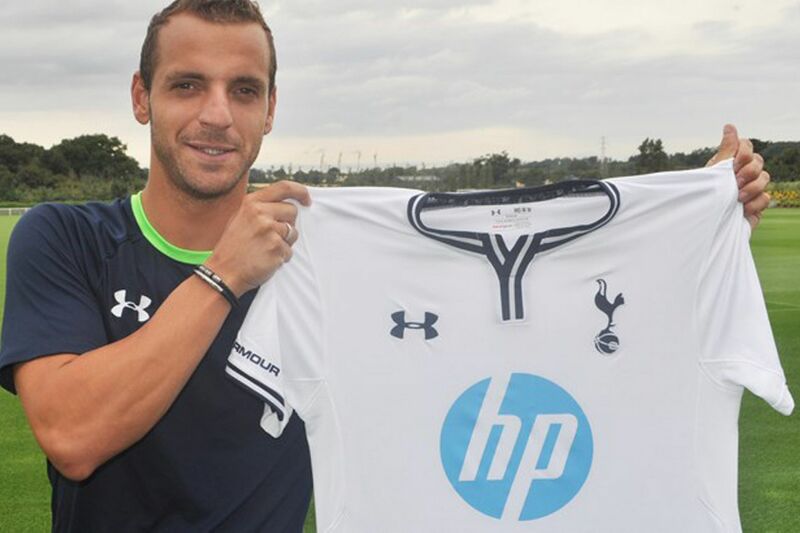 However, having scored over 20 goals for Valencia in each of his last 3 seasons, Soldado appears to be exactly what Spurs have lacked in recent years; a prolific true number 9. You’ll be unlikely to see Soldado scoring Bale like long shots this season, with all 24 of his goals last season being scored from inside the box, nor will we see him dancing around defenders with the ball; however in Soldado we now have a player with an exceptional ability to score with a first time shot. Soldado is clinical is his finishing, displayed in the fact that he had the third best chance conversion (23.6%) out of Europe’s top 5 leagues, behind only Messi and Lewandoski. Critics of Soldado will tell you that he often goes missing at times during games and has a bad disciplinary record; receiving 15 yellow cards in 41 appearances in all competitions for Valencia last season. However, as long as the Spaniard can replicate his goal scoring form for Spurs, I don't think many fans will criticise him for having a few quiet moments. A potential 4-3-3 utilising all three of our summer signings so far looks to be our best XI, of course depending on whether or not Bale stays. Either way, it's an exciting time to be a Spurs fan looking forward to the season ahead.